Applying design thinking to complex social issues, such as those explored by our Masters students at Dundee, requires a critical, well informed understanding of the underlying issues, a grasp of the broad theoretical approaches and an awareness of where to find current research on relevant themes. This blog post is intended to develop over time into a useful resource on the research that is available. It may evolve into a wiki – but let’s see. To begin with I have grouped useful sources of research below. 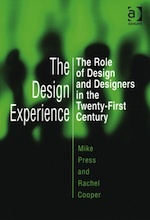 Just to make clear – this is NOT a research guide to the skills, methods and perspectives of service design. This can be found elsewhere. The priority here is to equip students (and practitioners) with the contextual knowledge and understanding of social changes and challenges, together with some of the institutional/political issues involved in designing for public services and communities. As it currently stands it is far from comprehensive – and I welcome any comments to improve the scope of this listing. Also note that it is designed primarily for postgraduate students of design in Scotland – which accounts for an overwhelming UK bias, although I think that there is some value here for those outside the UK. Design has a considerable role to play in the development of public services. At the start of your project it is worth familiarising yourself with some recent commentaries which are linked below. These help place your specific project into a broader context. As you will see, this new interest in design’s potential is in large part driven by the need to improve efficiencies in the delivery of services, and is also linked to policy frameworks such as the Big Society. Bear in mind that the Big Society is a highly contentious concept, and you should be familiar with some of the debates around it. Innovation by design in public services – series of articles and excellent overview. 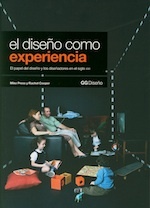 Blog from the London School of Economics on design in public services. Social by social – New technologies are changing the way we engage communities, run companies, deliver public services, participate in government and campaign for change – very useful resource. It is essential that designers approach socially located projects with humility, respect and an admission of their own strengths and weaknesses. Designers have expertise in creative methods, visualisation and problem solving. These strengths can play a vital role in empowering communities, helping stakeholders to solve problems and develop their own creative thinking. However, without an understanding of the deeper context and dynamics of community development, healthcare or social change, then their work can be uninformed, misdirected or even dangerously naive. The inherent danger is of giving people a false sense of expectation. We do not expect you to be experts in social science, but we do expect you to acquire an essential social literacy that is appropriate to your project domain. This will help you to understand and appreciate the perspectives of those other specialist professionals you will be working with, and the complexity of issues such as healthcare or poverty. A sense of history is also vital. We recommend making use of the open access learning materials from The Open University as an essential prerequisite of undertaking your project. Especially for students from outside Scotland and the UK, a basic understanding of social change in British communities is vital. The stories behind our streets looks at social change in cities such as Sheffield, Glasgow, Manchester and Cardiff. There is an archive of articles and learning materials on social policy that is worth browsing for your specific interests. Understanding Scotland – An introduction to the history of Scotland including aspects of social change and social problems. Poverty in Scotland – Contributions from leading academics, voluntary sector campaigners and practitioners, highlight the distinctive features of Scotland’s experience of poverty and the extent to which devolved and reserved policies have contributed to progress in tackling it. The meaning of crime – Explores the attitudes to crime and how it is socially defined. Problem populations, problem places – The entanglements of welfare, crime and society. It encourages you to think through these entanglements through a focus on ‘problem populations and problem places’. The limits to primary care – Access to community services. Introducing public health – Introduces some key elements of public health and health promotion, using a video case study of Coventry. It focuses on the major determinants of health and ill health and the scope of public health work. In addition to the specific recommended materials above, we encourage you to browse the learning materials on social science for areas of more specific relevance to your project. “A think tank (or policy institute) is an organization that conducts research and engages in advocacy in areas such as social policy, political strategy, economics, military, and technology issues.” Most of them are non-profit and non-governmental, although there are exceptions to this. They tend to have a political orientation, which you need to appreciate in order to understand the objectives that their research seeks to pursue. A full list of UK think tanks can be found here. These organisations are a vital source of research on the issues you are dealing with. They are in most cases seeking to explore innovation in public service delivery, conduct high level robust research and – most importantly – make their work freely available. But it is vital that you understand the political and/or policy perspectives that they are seeking to pursue. Alongside some of the Think Tanks listed below I have given some examples of recent publications as an indication of the type of research they publish. A right of centre think tank (in the interests of balance!). Social and community issues is not a priority, but they have produced publications on health service reform that argues for a pro-market approach. Claims to be “the UK’s leading not-for-profit company dedicated to tackling disadvantage and promoting social inclusion in the labour market.” They have published research on employment, social inclusion, poverty, welfare and welfare reform and other issues. All research available online. Established in the early 1990s to address a perceived crisis in politics, it developed into a largely pro New Labour think tank, but has since returned to a less aligned organisation. It has undertaken some vital research in crime, citizenship, education, social mobility and capability building. All publications are online. Also includes the highly relevant Journey to the Interface project. “Drawing on over 50 interviews with service innovators from the public, private and voluntary sectors The Journey to the Interface makes the case for a fresh approach to public service reform – an approach that is less about competition and contestability, and more about closing the gap between what people want and need, and what service organisations do. Claims to be “the UK’s leading progressive thinktank. We produce rigorous research and innovative policy ideas for a fair, democratic and sustainable world.” Politically influential and broadly left of centre. Very useful publications which are largely all available online. You can also search by current research projects, which include work on communities. They conduct and commission research into poverty, housing, inequality, education, healthcare and other social issues. A respected, long established think tank that has respect across the political spectrum and has a comprehensive achive of online research reports and other publications. “Involving service users in shaping local services, a study by Age Concern London, brought commissioners and service users together to discuss how service users can be involved in shaping local services. This is a well established and highly respected organisation that researches and campaigns on health and social care. All publications online and a good search system. “An independent think-and-do tank that inspires and demonstrates real economic well-being. We aim to improve quality of life by promoting innovative solutions that challenge mainstream thinking on economic, environment and social issues.” Publications cover a range of issues, including social policy and well being. “Creating Stronger and More Inclusive Communities provides some lessons for positive action in the context of austerity. “An independent charity with a mission to help people and organisations bring great ideas to life.” A considerable amount of highly relevant research available, including the co-production catalogue, examples of collaborative public services in action, with a particular focus on health and social care. 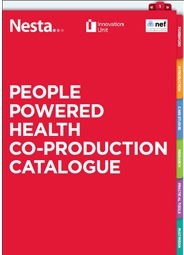 “The co-production catalogue brings together some inspiring examples of collaborative public services in action, with a particular focus on health and social care. Undertakes research on healthcare with an extensive archive of research reports. “An enlightenment organisation committed to finding innovative practical solutions to today’s social challenges.” A long standing commitment to applying design to social issues, and a range of publications and research reports available. “Cross-party think tank, developing innovative ideas across a broad range of economic and social policy.” Publications available on a range of issues including housing and communities, poverty, education, health and social care. “Brings together insights, innovation and entrepreneurship to meet social needs. We have a track record of over 50 years’ success with ventures such as the Open University, Which?, the School for Social Entrepreneurs and Healthline (the precursor of NHS Direct).” Valuable range of publications that include social design. “Research focuses on innovation and economic change, the role of cities, labour market disadvantage, health and wellbeing at work and how organisational change can promote good work.” Excellent archive of research reports. Having downloaded reports on relevant aspects of healthcare, social policy, crime prevention or whatever area of literature is most relevant, you need to archive this most appropriately and make sense of it in a way to inform your work. I recommend either Devonthink or Papers as excellent Mac applications for developing a digital library.